John Enders is a freelance writer, photographer, and journalist with interests in blue-water sailing. international business, foreign policy, wine and exotic travel. 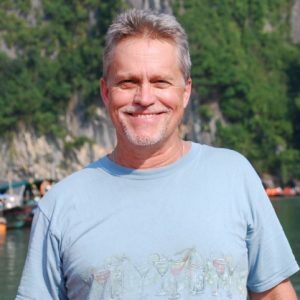 He worked as a reporter and editor for the Associated Press, and served as the editor of the Ashland Daily Tidings and as the executive director of the Southern Oregon Historical Society. 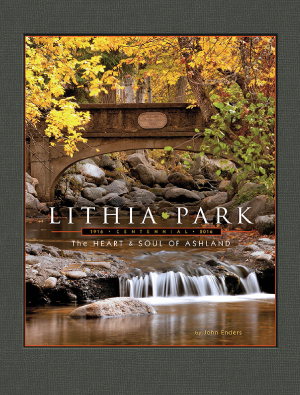 In honor of the centennial of Ashland’s Lithia Park, Enders has released his book Lithia Park: The Heart and Soul of Ashland. Enders’ great-grandfather, Henry G. Enders was on the first Parks Commission. EB: What prompted you to write this book on Ashland’s Lithia Park? JE: In a conversation two years ago with Bruce Dickens, then-superintendent of Lithia Park, it became clear that a history of the park had never been written. When I started looking at it, I realized it was very timely, with the 100th anniversary of the park’s dedication coming up in 2016. EB: How did you go about researching the history of the park? Did you run into any difficulties? JE: First, I read everything I could find about the park. Marjorie Lutz O’Hara, Ashland’s longtime resident historian, wrote a pamphlet on the park’s history a number of years ago, and there were a couple of other short pieces published in various places. The biggest difficulty I had was convincing the Ashland Parks Foundation board members that it was a worthy project. That was difficult to understand, frankly. It is a fundraiser for the foundation. EB: What does the park’s history have to say about the values of Ashland, then and now? JE: The park is the centerpiece of the town. It says, very clearly, we value and appreciate open spaces, natural beauty, and conservation. EB: What was the most surprising thing that you learned? JE: That a group of 60 Ashland women were instrumental in convincing the men who ran the town that creation of the park must happen. EB: I understand that the park’s design was innovative for its time. How so? JE: The central portion of the park was designed by John Hays McLaren, the long-time superintendent of Golden Gate Park in San Francisco. And he was heavily influenced by his mentor, Frederick Law Olmstead, who had been instrumental in creating New York’s Central Park. The central idea of their park philosophy was simple: parks should be made for and accessible to all people, and should bring nature into the city. Throughout history, parks had largely been for the rich. EB: How has the park shaped present downtown Ashland, good and bad? JE: I see no downside. The park has been a central part of the town since it first was dedicated in 1906. The Ashland plaza is immediately adjacent to the entrance to the park, and visitors and locals alike use the park heavily for all sorts of activities. The idea that the city should have an permanent tax levy to fund parks, and that an elected parks commission should be in charge – independent of the city council – was a revolutionary concept. EB: If things had gone differently with the park, what would Ashland be like today? JE: A huge political struggle surrounded the first years of the park’s formation. The commercial club, the predecessor to the Chamber of Commerce, and others wanted to build a large, privately-operated “resort” in the middle of the park. Another faction, including my great-grandfather Henry Enders Sr., insisted that the park should remain in public hands and that private, for-profit activities in the park should be severely limited. The 100-acre park would not exist today if the first group had won the day. It was a brutal battle. One of the reasons I loved doing this book was the role my ancestor played as one of the first park commissioners. EB: What other projects are you working on? JE: I am a bit of a fanatic regarding the history and politics of Latin America, and as a journalist I lived and worked in South America for several years. I’m working on a book on the last days of Ché Guevara, who was killed in Bolivia in October 1967. It’s a collaboration with a Bolivian colleague and the Bolivian army officer who captured Ché. I’ve also got a couple of fiction projects underway. EB: Thanks for talking with us. This entry was posted in Interviews, Literary Events in Southern Oregon. Bookmark the permalink.